eal Answers, Practical Solutions and Over 75,000 Successful Projects Completed! who know how to get the job done"
At AET, our greatest asset is using our vast regulatory knowledge and project experience to save our clients' money! With certified investigators and project managers, each with over twenty years, of on site experience, we know what a project should cost and how long it should take. This allows AET to anticipate problems not seen by others and do the job right, the first time! If your problem involves; Asbestos, Lead, PCB, Mold, Water Damage, Industrial Hygiene, Indoor Air Quality, HVAC, OSHA, Underground Storage Tanks, Environmental Site Assessments, Vapor Intrusion, Brownfield Investigations, Restoration Consulting, Environmental Claims Investigation, Waste Disposal or Characterization, Expert Testimony or general environmental concerns, AET are the certified professionals to call! 20 Reasons Why you should become an AET client? Turnkey Contracting: AET's staff diversity, professional qualifications and project expertise assures our clients with a qualified single source to investigate and remediate environmental contaminants in commercial, industrial and residential work places. 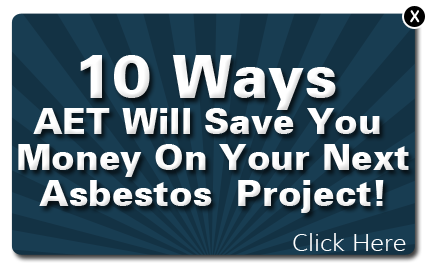 Make AET your first call for asbestos abatement, mold remediation, spill response, chemical spill cleanup and your projects will be completed on-time, on-budget with maximum control of health and safety considerations, and minimum interference with your business operations. Inspection, Sampling, Testing, Lab Analysis: Our licensed environmental professionals identify the presence, location and quantity of environmental contaminants and regulated materials at your facility, evaluate remediation options, and develop budgetary cost estimates. Our CIH's and CHMM's also evaluate engineering controls & personal protective equipment. Risk Assessments: Our CIH professionals are experts in OSHA/EPA compliance and health-based cost effective decision-making. We routinely prepare Operations and Maintenance Programs to manage in-place (rather than remove) environmental contaminants. Programs provide for training of employees and contractors who disturb them. Specifications/Work Plans: Our CIH design staff develops response actions to control or eliminate environmental hazards in the work place. Work documents include a detailed scope of work along with required work practices and controls. These documents can be used for competitive bidding purposes or to facilitate emergency repairs or abatement (where renovation or demolition has been halted). Management/Oversight: We represent you during remediation to ensure required engineering controls (isolation barriers, negative pressure) and work practices are implemented and maintained. Our inspections, sampling protocols and comprehensive documentation will provide the essential support information to limit exposure to contingent liabilities associated with remediation. Final Clearance: Is remediation work complete? Can work areas be re-occupied? Our CIH professionals will provide the long term assurance you need to answer these questions. Reduced Sale Prices, Tax Incentives in combination with Federal/State Release of Liabilities. Make these Eye Sores An Attractive Business Opportunity...AET has Proven expertise to make these properties WIN-WIN. 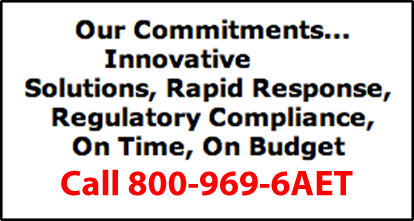 Emergency Preparedness and Emergency Response to fires, floods, hurricanes, sewage infiltration, terrorism.... AET has proven startegic decision-making protocols that will save you time and money. Revitalization of Historical Buildings in Downtowns, Main Streets,Waterfronts and Industrial Areas... Asbestos, Lead, USTs, PCBs, Contaminated Soil, and Groundwater.....Let AET's out-of-the-box strategies create a value added solution for you. Whether project planning or emergency response to a previously unknown or concealed condition, make AET your first call to get answers and to address your tenant or employee concerns. Whether new construction or existing buildings, green building goals involve reducing building operation costs by conserving energy and the implementation of strategic design/construction and preventative maintenance practices. Happier tenants can mean fewer vacancies, higher rents, great resale value and consistent and continual R.O.I. for property owners. "Since 2003, timely professional inspections of over 250 retail facilities throughout the US prior to store occupancy to identify multiple environmental parameters and provided reliable and innovative solutions to manage our Environmental Risks" Director of Store Design Dollar Tree Stores, Inc.